We take one humdinger of a Hummer for a spin. You can't throw a bespoke winch hook these days without breaking the windshield of a beautifully restored vintage truck. Really, the place is lousy with pricey Toyota Land Cruisers, Ford Broncos, and Land Rover Defenders torn down to the last bolt and rebuilt with painstaking precision. It's all getting to be a little...predictable. 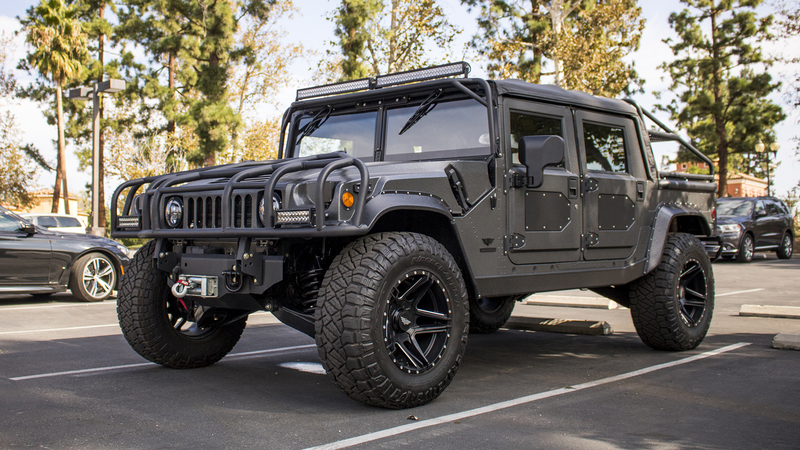 Enter: the Mil-Spec Hummer H1. Roll up the the thundering promise and haphazard reality of America into a single vehicle, and you might get something like the H1. The original Hummer is a mighty machine, an ex-military bad boy that can ford 30 inches of water and climb a 60-degree slope. Almost nothing separates the H1 from the military Humvee aside from a few cursory nods to civilian life—a stereo, for example. And true to its roots in a U.S. government contract, it's also clunky, slow, uncomfortable, and wildly overpriced. It's a downright chore to operate. 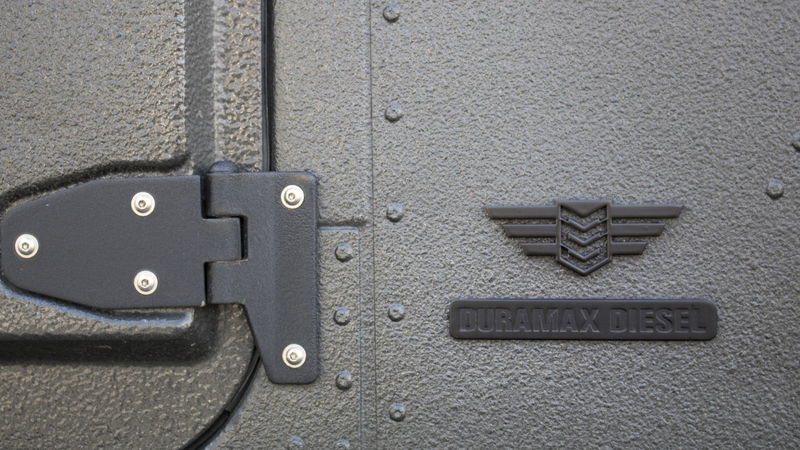 But while some see a spartan rig, others see a blank canvas. Mil-Spec Automotive was founded in 2015 with a simple, if ambitious, idea: what if old Hummers were given the white-glove treatment like the icons they truly are? What if someone—stay with me here—could make the H1 worth the Pentagon-spec price tag? The act of pouring money into a brute like the Hummer H1 is sure to raise some skeptics, as is turning around and charging a quarter of a million dollars for one. But the company is certain that now is the time for such a transformation—and the fact that it's already sold the six trucks scheduled to be completed in 2019 suggests it might be onto something. And to prove that a $250,000 H1 is worth that kind of scratch, Mil-Spec invited The Drive to take a spin in #001, its very first model. "To me, growing up, the Hummer was always the ultimate off-road rig. But it was never something that I thought was done right. It really had a poor reputation in a lot of ways," Mil-Spec's 23-year-old owner and CEO Adam Mitchell told me. "I had a vision—I wanted to do my best to change what the vehicle represents to people." More remarkable than the mission are the three sons of Michigan at Mil-Spec's helm. Mitchell, company president Chris Van Scyoc, and chief innovation officer Ian Broekman are all in their early twenties. (Compare that to the grizzled old guard behind much of the modern restoration scene.) In an environment where experience is everything, youth can be a distinct disadvantage. Talking to the trio, though, it's clear their age has been an asset—for both working the requisite 100-hour weeks at the outset of any new business and zeroing in on a Hummer-sized blind spot in a heavily-saturated market. Simply put, no one was giving the truck its due. "The auto industry is shifting away from creating icons. There’s a lot of homogenization, a lot of standardization. The brands are blending together," Mil-Spec's 22-year-old Chief Innovation Officer Ian Broekman said. "People from our generation are looking to older cars and wishing that we could modernize them, or create some sort of high design version." Such statements inevitably draw comparisons to Singer and its reimagined Porsches or Jonathan Ward's shop of wonders at Icon 4x4. The work does, too. Starting with a donor H1 of any body style, Mil-Spec completely disassembles the vehicle at its Wichita factory, stripping it down to a bare frame and body. The former is sand-blasted, powder coated, and lovingly rebuilt by hand; the latter, meanwhile, is strengthened with 10-gauge aluminum to stiffen the shell and new welds where AM General was particularly generous with the hot glue gun. It's then that the heavy lifting can commence. Gone is the creaky, woefully underpowered base engine, replaced with a stout 6.6-liter Duramax turbodiesel V-8 jacked up to around 500 horsepower and 1,000 pound-feet of torque. An Allison 1000 six-speed automatic transmission ensures smooth delivery of all that muscle, while a part-time 4WD transfer case from a Chevy Sillverado HD replaces the Hummer's original full-time system. Which means, yes, this beast can do burnouts in rear-wheel drive. Other, less-visible upgrades include substantial improvements to powertrain cooling systems, extensive cabin insulation, vented and slotted inboard brake rotors, strengthened portal axles and steering, a locking rear differential, and a custom suspension tune. Suffice it to say, no H1 has ever been built to these exacting standards—especially not one from the factory. "There are a lot of small defects in the original. This billion-dollar company that actually developed and built the H1 did it wrong, and now we’re sitting here like, okay, we as a small company have to do it right," Van Scyoc said, chuckling. "It’s funny going back and digging out the mistakes they hid in there as they were trying to crank out Humvees as quick as possible. They're like real bad Easter eggs." A bigger challenge lies in enhancing the H1's rugged style for the modern market. As a baseline, the exterior gets little more than a durable bedliner-type coating, new wheels, and new LED lighting. The Hummer has always traded on its warlike posture—you don't mess with success. But should you insist on trying, Mil-Spec is happy to provide an extensive options list that lets you tack on everything from power running boards to a functional hood scoop to a Baja-inspired long-travel suspension package. 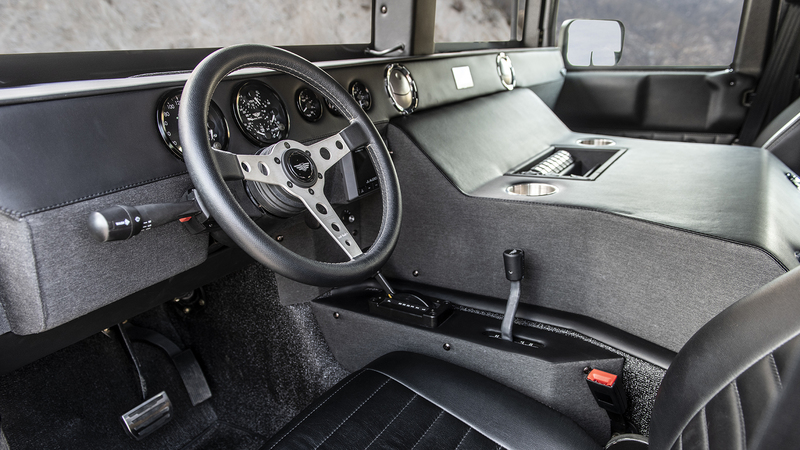 But it's the interior where Mil-Spec is really trying to separate its H1s from your everyday off-road build. Its fundamental setup—front-mid-engined with a high-riding chassis—makes for an awkward cabin with loads of wasted space. Not much can be done to alter the basic layout, but Mil-Spec aims to distract you with a level of quality heretofore unseen in a Hummer. "We like to see these trucks as art. It’s a cliché, but it’s really true," Broekman said. "And when you have 7,000 parts that you’re putting together from scratch, there’s a lot of opportunity for uniqueness." 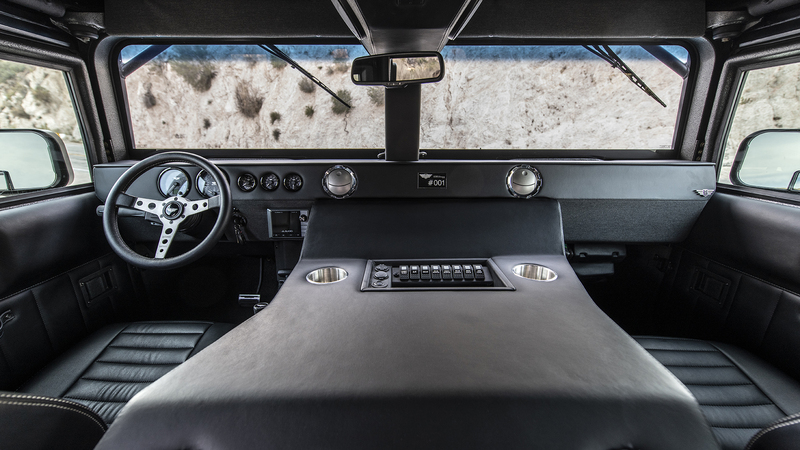 The old-school steering wheel, simplified Speedhut gauges, modern bucket seats, and extensive padding all around are well-met, and no restoration is complete these days without a thumping Bluetooth-capable sound system. Yet it's the overhauled HVAC system, a notorious weak spot on the original trucks, and new insulation that make the most difference from an everyday perspective. All that love (and labor) doesn't come cheap, with the cheapest Mil-Spec build starting at $218,500. Clamp those whistling lips shut—it's definitely a lot of money, but it's also right around the original inflation-adjusted MSRP for the 2006 Hummer H1 Alpha, the final year blowout model whose extra bells and whistles have made it a bonafide collector's item that still trades north of $200K. It's one thing for market forces to push an old truck's value to $200,000. It's quite another for a new company to rebuild one and slap an equivalent price tag on it. 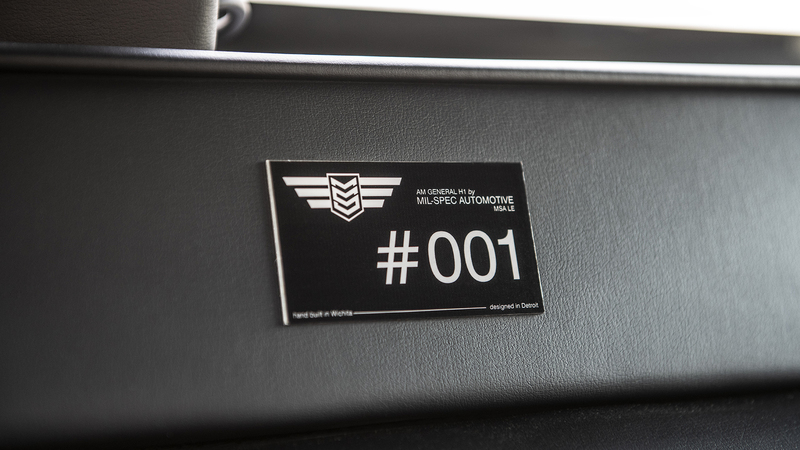 Fortunately, the driving experience in #001 does feel like a six-figure transformation. The original Hummer's 0-60 mph time is measured in double-digits; the new engine drops that under six seconds. That the truck feels totally composed when hustling forward with a rapidity it was never meant to achieve is a real testament to the engineering done by Mil-Spec. There's a ferocity to the powertrain that perfectly matches its aggro vibe. Raw, angry, overpowered in the best possible way—this is how the Hummer was always meant to feel. It's not fast, it's forceful. Giving the H1 enough grunt to get up and go also opens up new avenues for evaluating the rest of the vehicle. The steering is light and accurate enough when you toss it into a turn, the retuned suspension doesn't break spines or induce nausea, and the brakes stop the 7,500-pound truck with a welcome immediacy. If you can somehow block out the completely flat windshield, the on-road experience is not unlike a heavy-duty pickup. You won't forget how broad or tall it is—it's hard to hide seven-and-a-half feet of width and those gigantic 38x15.5R20LT tires—but truly, you won't care. There's something deeply liberating about watching a sea of traffic part before you in quaking obedience. You feel like Bruce Almighty in this rig. You are in charge. Love it or hate it, very few things make that statement so convincingly. Despite the fact that these trucks are being bought by folks who probably don't venture off the pavement very often, Mil-Spec spends weeks torture-testing them at its own private proving grounds outside its Wichita facility. After all, the Mil-Spec H1s absolutely have to retain—and in some cases, enhance—the Hummer's famed off-road abilities. "The three of us have beat the living hell out of our trucks, and we take a lot of enjoyment in that," Mitchell said, grinning. "We even ran over a couple cars, because God forbid some rich guy is like Hey, I want to buy a Prius and crush it, and then the truck can't do it." A quick off-road jaunt in #001 that included a 40-degree descent confirmed the trucks can scramble in the dirt with the best of them. Aside from the new locking rear differential, another off-road power-up comes from repositioning the shock mounts to provide the same amount of compression and rebound. I wouldn't call it butter smooth, but it's a notable improvement from stock. Yet mechanical changes alone can't push a project into rarified air. For that, you need a certain je ne sais quoi, an essential feeling of worth and value that pours from every surface and touch point. In that regard, especially in the cabin, Mil-Spec is still figuring things out. 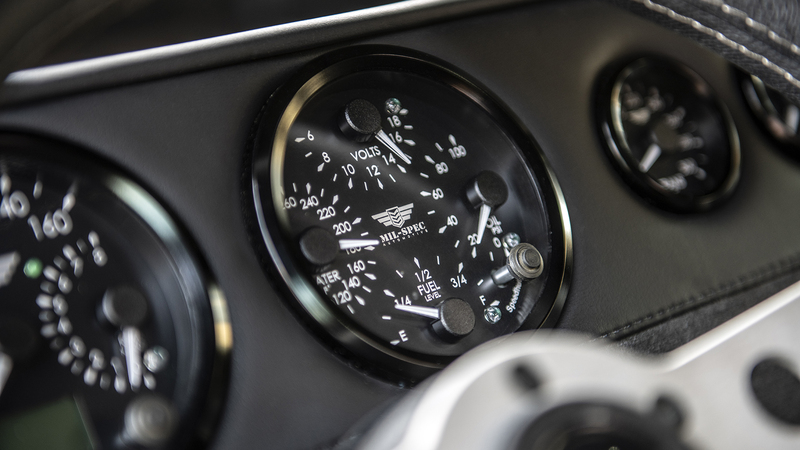 Climb into a Singer Porsche or an East Coast Defender and you're immediately blown away by the minute details, the deep thought behind every single decision, and the sheer level of craftsmanship. That's not quite the case here. The compromises range from cheap HVAC vents pulled out of a Ford Super Duty pickup to plastic accessory toggle switches with stickers for labels—and all of them would give me serious pause before I dropped the equivalent of a four-year college education on a restored Hummer. Though the vinyl is a functional choice, especially in the convertible-topped #001, the fact that it's not buttressed by astounding craftsmanship makes it feel somewhat cheap. And there's an overall reliance on off-the-shelf parts; more custom work would go a long way towards giving the Mil-Spec H1 that special something. That said, I ended the test drive with a clear understanding of what Mitchell, Van Scyoc, and Broekman are doing—and why they're doing it. The automotive world is in the midst of a generational shift, and with that comes new perspectives on what makes an icon. Just look at how cars from the 1980s and 1990s have exploded in popularity over the last decade as the kids who grew up with them become adults with disposable incomes. Consider Radwood, or the Sotheby's Youngtimer auction—or to pick a more germane example, the fact that Icon 4x4 recently did a frame-off restoration of a 1996 Toyota Land Cruiser. Even if the level of refinement isn't quite there yet, Mil-Spec is firmly ensconced in that next wave of enthusiasm and passion. It was only a matter of time before someone saw—and acted upon—the promise of the Hummer H1. "People take interest in the truck not only because of the product, but because of the romanticized process that goes into building it," Mitchell said. "At the end of the day, someone would much rather have something that’s hand crafted with a lot of thought and love put into it, where nothing’s overlooked." And whether or not you're buying all this, remember: You don't have to. The six build slots for 2019 have already been sold; after that, Mitchell says the company will refresh the design and start ramping up volume. The next big step is to figure out an electric powertrain alternative to the turbodiesel, while the trio's ultimate goal is to one day design their own vehicle from the ground up. Ambitious? Absolutely. But so is charging $250,000 for a Hummer.